Hilawi, the story based on the ancient fable of the Ojha Clan is one greatly imagined by the author Ritu Lalit. The first glance of the book makes one curious to know what actually “Hilawi” is, which is revealed partially in the beginning. 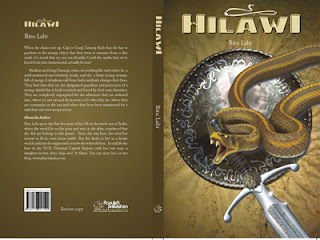 The author brings out adventure and thrill together in this novel with a catchy title “Hilawi”. The author, Ritu Lalit, spent the first few years of her life in the north east of India, where she would lie on the grass and stare at the skies, convinced that she did not belong to this planet. And her desire to live in a dream world could not be suppressed, so now she writes fiction. The story revolves around a twin pair, Yaduvir and Gargi, who are unprepared for the strange fable they were told and the adventure they were rocketed into. “Hilawi” is their protector as well as a good luck to both of them, struggling to complete the task for which they were born, constantly on a run. They do it for their bloodline in a fight with their own clansmen, for the strange thing they don’t even know the origin of. Throughout their journey and run to save the ancient lucky charm of theirs, they learn to survive in the worst situations and knew that life here isn’t that easy for them, than that they continued to live till now. The book is engrossing and its fantasy seems to be true and alive once you start reading it. Still some would miss the descriptive writing and narrations. Author has sectioned the book in under a small descriptive title of each chapter, which is about just 7-8 pages. One will find the adventure burning more while going ahead through each of the chapters. The epilogue would bring out questions in one's mind. Storyline is wonderfully imagined and the end would keep a little of suspense in the readers mind, which in my opinion is the best part. This book may be a called the short and the ADVENTUROUS one. On the whole, this story full of mysticism, fantastic writing and gripping narration would attract the readers. Once they start reading they will surely be interested to know the end, which will further thrill them to know more of it. Doesn’t matter you like love stories more, because this one has a thrilling love story instead which will interest you. Do read this wonderful attempt and you will surely like this.